In Print (Delivery period: 15 days). The results of a conference on recent developments in the nuclear sciences, this volume contains papers on Tokamak fusion reactor technology, fission reactors, nuclear medical applications, astrophysical applications, nuclear structure, data decay, nuclear models and evaluation methodology. Opening Session.- Welcome and Greetings.- Nuclear research in an interdisciplinary environment (General lecture).- Energy systems in transition under the conditions of the future (General lecture).- I Nuclear Data Relevant to Fission Reactors and some Fundamental Studies with Slow Neutrons.- Medium and long term data needs for advanced fission reactors.- Nuclear and nucleon data needs for incineration of the radioactive wastes from fission reactors with a proton accelerator.- Validation of fission product capture cross sections by the analysis of thermal and epithermal integral experiments.- Measurement of the sub-thermal neutron induced fission cross section of 241Pu.- On ? of 235U for sub-thermal neutron energies.- 56Fe and 60Ni resonance parameters.- Resonance neutron capture in structural materials.- Measurements of ke V-neutron capture gamma rays from some structural and shielding materials.- Measurements of energy dependence of average number of prompt neutrons from neutron-induced fission of 235U, 241Am and 243Am From 0.5 To 12 Mev.- Radiative neutron-capture in some low lying resonances of 52Cr.- Measurement of the thermal neutron cross section and resonance integral of the reaction 137CS(n,? )138Cs.- Neutron scattering in 239Pu from 0.2 to 1.0 MeV.- Average fast neutron radiative capture cross sections for fission products and for isotopes of rare earth elements.- Measurement of capture cross sections for 238U, Au and Sb.- Cross sections of the reactions 55Mn(n,2n)54Mn, 58Ni(n,2n)57Ni and 58Ni(n,np )57Co averaged over the U-235 fission neutron spectrum.- Resonance parameters of 58Ni + n and 60Ni + n from very high resolution transmission measurements.- High resolution neutron transmission measurements for U and Sc thick composite filters.- Experiments on search and investigation of unusual neutron resonances.- On the study of neutron resonances in 147Sm.- Measurement and analysis of resonance structure for U-238 total and radiative capture cross sections in energy range of 0.465 – 200 KeV.- Study of the delayed neutron yield and its time dependence by the summation method, and the sensitivity of the yield to parameters of the independent yield model and the decay data.- Delayed neutron yields for 39 fissile systems.- Nuclear physics information needed for accelerator driven transmutation of nuclear waste.- Cross sections for actinide burner reactors.- Evaluation of total fission characteristics for 235U in the low energy region.- Simultaneous evaluation for correlated data of 239Pu, 238U, 235U(n,f) and 238U(n,?) cross section.- Evaluation and testing of n + 239Pu data for ENDF/B-VI in the KeV and MeV energy region.- Multilevel S-matrix analysis of U-235 neutron cross sections up to 93 eV using the collision matrix unitarity method.- Multilevel resonance analysis of 59Co neutron transmission measurements.- Averaged U-238 fission cross section measurement in Cf-252 neutron spectrum.- Double-differential cross section of neutron emission from 235U at 4.9 MeV neutron incidence energy.- Comparative analysis of the energy spectra of neutrons emitted by fission fragments and excited nuclei.- Gamma-rays of some principal fuel nuclei excited by monochromatic neutrons.- Effects of the two-fission-neutron distributions in reactivity measurements with the 252Cf source.- Cold fragmentation properties of 252Cf(SF).- Nuclide yields of light fission products for 241Am(2nth,f) at different kinetic energies.- Fragment yields from the fission reactions 232U(n,f) and 239Pu(n,f).- Investigation of the p-resonance properties in slow neutron fission of 235U.- Isotonic yields and neutron evaporation in fission.- Uranium cold fragmentation by thermal and fast neutrons.- Mass yields in the very asymmetric fission of 249Cf(nth,f).- Odd-even effects in the reaction 241Am(2n,f).- Fission gamma-ray multiplicity measurements in 233U, 235U, 237Np and 239Pu low energy fission resonances.- Peculiarity of the fission of 239Pu by resonance neutrons.- Pairing effects in neutron fission cross section for actinides.- Packed cluster model for photofission aspects of the giant resonance.- Measurement of the neutron total cross sections for Bi and Pb: estimate of the electric polarizability of the neutron.- Electric properties of the neutron from precision cross section measurements.- II Data Testing and Validation for Reactors.- Thermal and epithermal data assessment for fission reactors.- New perspective in covariance evaluation for nuclear data.- Nuclear data processing, analyses, transformation and storage with PADE-approximants.- Nuclear data improvements in the decade with special emphasis on very recent data evaluations, and their application to thermal and fast reactor analysis.- Analysis of thermal benchmarks based on the evaluated nuclear data files JEF-2 and ENDF/B-VI.- The measurement of fast reactor irradiated minor actinides and comparison with neutron physics calculations.- Neutron data check by sample reactivity measurements in critical assemblies with predetermined adjoint spectra.- Validation of recent dosimetry files in Li(d,n) neutron field.- Recent advances in utilization of the R-matrix parameters for reactor applications.- Representation of the fission spectrum and multiplication calculations.- SN validation of JEF-1 data on the PCA-replica shielding benchmark.- Benchmark test of JEF-2 and ENDF/B-VI evaluations by calculating some criticalities.- Correction of neutron constants of lead based on results of integral experiments.- Integral experiments with regard to the thorium-based hybrid fusion blanket.- Measurement of leakage neutron spectra from various spherical piles of five elements with 14 MeV neutrons.- Calculation and measurement of neutron and gamma-ray fluxes in low power reactors.- Preparation of a cross section library for a 3 MW triga reactor and its validation through some applications.- Development of a common nuclear group constants library system: JSSTDL-295n-104? 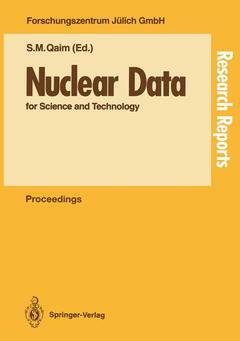 based on JENDL-3 nuclear data library.- CRISY: a critical assemblies documentation system.- Modelling neutron transmission experiments and demonstration of resonance shielding effects by using evaluated nuclear data files.- Impact of different libraries on the performance calculation of a MODUL-type pebble bed HTR.- Pu-239 and U-238 resonance cross-section reevaluation: influence on HCLWR cell characteristics.- Application of the ROMB-assembly and the cylindrical heterogeneous critical assemblies for testing of neutron data.- III Nuclear Data for Fusion Reactor Technology.- Neutron diagnostics for tokamak experiments.- Nuclear data for fusion materials research.- Objectives for low activation materials and the data implications.- Nuclear data needs and status for fusion reactor technology.- Report on the IAEA coordinated research programme on activation cross sections for the generation of long-lived activities of importance in fusion reactor technology.- NEANDC working group on activation cross sections. comparison of activation cross sections measurements perfomed with different neutron source reactions in the 5–13 MeV range.- Measurements of the neutron cross section for 54Fe(n,? )51Cr between 5.3 and 14.6 MeV.- Neutron activation cross sections for 60Ni(n,p)60mCo, 60Ni(n,p)60m+gCo and 58Ni(n,p)58mCo reactions in the 5 to 12 MeV neutron energy range.- Activation cross section measurement at neutron energies of 9.5, 11.0, 12.0 and 13.2 MeV using 1H(11B,n)11C neutron source at JAERI.- Differential and integral cross section measurements of some (n, charged particle) reactions on titanium.- Double-differential neutron emission cross sections of 51V, 181Ta, natW and 238U at 14 MeV neutron incidence energy.- Double-differential gamma-ray production cross sections of Al, Fe and Si for neutrons between 8.5 and 14.2 MeV.- Experimental and calculated excitation functions for discrete-line gamma-ray production due to 1–40 MeV neutron interactions with 56Fe.- Measurement of double differential (n,x?) cross sections of natNi, 58Ni, 60Ni, natCu, 63Cu and 65Cu in the 5 to 14 MeV neutron energy range.- Tritium breeding ratio in Li/Pb-Li/Pb-Li-C spheres measured with Li2C03 pellets and/or LiF TLDs.- Elastic and inelastic neutron scattering on carbon-12.- Small angle scattering cross sections of 14.8 MeV neutrons from Fe, Ni and Cr.- Measurement of Li-7(n,n??) (478 keV) inelastic angular distribution derived via the shape analysis of the doppler shifted ?-ray spectrum (DSM) at 14.9 MeV.- Double-differential neutron emission cross section of 9Be.- Gamma-ray production cross section measurements of some structural materials between 7.8 and 13.0 MeV.- Progress in the measurement of gamma-ray production cross sections induced by 14.9 MeV neutrons.- Neutron leakage spectra and tritium production rate of a hybrid-reactor blanket-assembly.- Measurements and analyses of angular neutron flux spectra on liquid nitrogen, liquid oxygen and iron slabs.- Methodology for the generation of neutron kerma factors from JEF-2 lithium-7 data.- Re-analysis of SWINPC beryllium integral experiment.- Measurement of neutron multiplications in beryllium assemblies.- Double-differential neutron emission cross section of 238U and 232Th for 18 MeV incident neutrons.- Cross sections for the production of helium and long-living radioactive isotopes by protons and deuterons.- Excitation functions of some (n,p), (n,2n) and (n,?) reactions on nickel, zirconium and niobium isotopes in the energy range 13.64 – 14.83 MeV.- Measurement of the 60Ni(n,p )60Co cross section in the neutron energy range 6 – 13 MeV.- Measurement of formation cross sections of short-lived nuclei by 14 MeV neutrons.- Measurements of long-lived activation cross sections by 14 MeV neutrons at FNS.- Capture cross sections of terbium, thulium, hafnium and tungsten.- Measurement and analysis of 98Mo(n,? )99Mo reaction cross section.- Measurements of activation cross sections of iron, nickel, cobalt and zirconium isotopes at neutron energies 13.6 – 14.9 MeV.- 14.6 MeV neutron induced reaction cross section measurements.- IV Experimental Facilities and Techniques.- Accelerator mass spectrometry and its impact on nuclear data studies.- New neutron facilities for nuclear data measurements at En > 10 MeV.- Neutron sources for fusion materials testing.- Prerequisites for accurate activation cross-section measurements.- Rapid radiochemical separation procedures from aqueous solutions.- Facilities for measuring (n,z) reactions.- Neutron scattering: technological achievements and illustrative results.- White source gamma-ray production spectral measurement facilities in the USA.- The absolute response function of the harwell deuterated benzene total energy detectors to 6.13 MeV ?-rays.- Measurements of gamma-ray spectra from neutron capture in single resonances.- Neutron energy spectra from proton irradiated thick Li targets.- A new approach to solve the problem of source break-up neutron interference in secondary neutron spectrum measurement.- Measurement of highly active isotope fission cross sections with nuclear explosion neutrons.- The measurement of the 10B content of enriched samples of boron using neutron time of flight techniques.- The neutron leakage spectra from beryllium and aluminium spheres for 14 MeV neutron source within the energy interval 6 – 15 MeV.- New type of experiment for average resonance parameter estimation in unresolved neutron resonance region.- Highly enriched samples of uranium and transuranic element isotopes for scientific investigations.- Measurements of bremsstrahlung spectra from 50 MeV electrons on Ta and photoneutrons energy distribution from light, medium and heavy nuclei.- Application of thin-film breakdown counters for registration of fission fragments in photofission and nuclear reactor physics experiments.- Validation experiments of nuclear characteristics of the fast-thermal system Herbe.- Investigation of total cross section characteristics in the region of unresolved resonances.- An empirical look at the calculation of the unassociated particle anisotropy factors for the determination of neutron production from the D(d,n)3He reaction at bombarding energies below 500 keV.- A specific light ion “dE-E-T” telescope.- A new method for measurement of (n,2n) cross section.- A post-acceleration beam chopper for 4.5 MV dynamitron pulsed neutron generator.- High efficiency charged-particle spectrometer using gridded ionization chamber for fast-neutron induced reactions.- Investigation of prescission neutron emission in 235U (nth,f) using a back-to-back gridded ionisation chamber.- A pulsed neutron TOF facility at Chiang Mai.- Linear accelerator of all-union scientific research institute of experimental physics for neutron spectrometry.- Complex of intense pulsed neutron sources of moscow meson factory for time-of-flight experiments.- Double differential neutron emission cross section of (p,n) reaction on silver isotopes using 9, 11 and 13 MeV protons.- Tailoring of heafely neutron generator spectra to suit fusion blanket programme.- Absolute differential cross section of the 14N(d,? )12C reactions from 2 to 12 MeV.- V Nuclear Data Relevant to Standards.- Measurement of the 10B(n,?1?) 7Li cross section in the 0.3 to 4 MeV neutron energy interval.- Absolute measurements of neutron induced fission cross sections of 235U, 238U, 237Np and 239Pu using the time correlated associated particle method (TCAPM).- The 238U(n,f) cross section and its ratio to the 27Al(n,? )24Na and 56Fe(n,p)56Mn cross section in the 14 MeV region.- Measurements of the 235U(n,f) cross section in the 3 to 30 MeV neutron energy region.- IAEA coordinated research programme on X- and gamma-ray standards for detector calibration.- Energy spectra and angular correlations of neutrons emitted in spontaneous fission of 248Cm and 252Cf.- Absolute measurement of cross sections of 27Al(n,? )24Na and 56Fe(n,p)56Mn at En = 14.6 MeV.- Cross section data for proton, 3He and ?-particle induced reactions on natNi, natCu and natTi for monitoring beam performance.- Production of a reference monoenergetic neutron field using D(d,n)3He reaction.- VI Nuclear Structure and Decay Data.- New calculations of ?-decay data of nuclei far from stability.- Fission product decay power — AESJ recommendation.- Average beta and gamma energies of fission products in the mass range 98 – 108.- Measurement of beta-decay strength distributions of fission-product isotopes using a total absorption gamma-ray spectrometer.- Nuclear decay scheme measurements at the UK National Physical Laboratory.- Project “International table of nuclides properties” relevant to the shell structure of the atomic nuclei.- Decay heat calculation: an international nuclear code comparison.- Determination of the half-life of 59Ni and the 60Ni(n,2n) cross section.- Precision measurements of radioactive decay data.- Measurement of half-lives of short-lived nuclei.- Decay studies of 245Cm.- VII Nuclear Data for Medical Applications.- Nuclear data for medical radionuclide production. radioisotopes for emission tomography.- Nuclear data relevant to particle radiation therapy today and tomorrow.- Determination of kerma factors for A-150 plastic and carbon for neutron energies above 20 MeV.- Measurement of C, Mg and Fe kerma factors and the 19F(n,2n)18F cross section for 18 to 27 MeV neutrons.- Intermediate-state structure in the 12C(n,n3?) and 160(n,n4?) breakup induced by 22.5 and 25.4 MeV neutrons.- Production of tungsten-188 and osmium-194 in a nuclear reactor for new clinical generators.- Fission neutron spectrum averaged cross sections of some threshold reactions on molybdenum and nickel: relevance to the production of 99Mo and 57Co.- Cross sections of proton induced nuclear reactions on Kr gas relevant to the production of medically important radioisotopes 81Rb and 82mRb.- Excitation functions of proton induced nuclear reactions on 111Cd and 112Cd. Production Of 111In.- Cross sections for the 100 MeV proton-induced nuclear reactions and yields of some radionuclides used in nuclear medicine.- An analysis of reaction cross-section calculational methods for the production of medical radioisotopes.- Excitation function and yield for 97Ru production in 99Tc(p,3n)97Ru reaction in 20 – 100 MeV proton energy range.- Optimization of isotope production by cross section determination.- Production of 66Ga, a positron emitting nuclide for radioimmunotherapy.- VIII Nuclear Data Relevant to Astrophysics, Geology, Neutron Dosimetry and some other Applications.- Data needs in astrophysical studies.- Measurements of keV neutron capture cross sections of 122,123,124,125,126Te with a 4? barium fluoride detector.- 147Pm — an experimental stellar cross section for a short-lived s-process branching point.- r-process abundances and nuclear properties far from stability.- (n,p) and (n,?) cross-section measurements with astrophysical applications.- The stellar (n,?) cross sections for 87Rb and 192Pt.- Nuclear data for geology and mining.- Integral experiments for reactor pressure vessel neutron exposure evaluation.- New nuclear data requirements for radiation monitoring at high intensity proton accelerators.- Cross sections of 113In(n,n? )113mIn and 113In(n,2n)112m,gIn reactions around 2 and 14 MeV neutron energies.- Cross section measurements of neutron induced reactions on the zirconium isotopes in the energy range of 5.4 to 12.3 MeV.- Measurement of the 23Na(n,2n)22Na cross section at En = 19.45 MeV and model calculations of cross sections for neutron induced reactions on 23Na.- The (n,2n) cross section measurement for 23Na.- 107,109Ag(n,3/5n)105Ag Reaction Cross Section for 20 MeV < En < 70 MeV.- Gamma-induced 115mIn production in the 0–50 MeV energy region.- Charged particle reactions for radiation protection of a medium energy cyclotron.- Nuclear data needed for industrial neutron sources.- Production of neutrons from water, polyethylene, tissue equivalent material and CR-39 irradiated with 2.5–30 MeV photons.- IX Medium Energy Data.- New techniques in neutron data measurements above 30 MeV.- Nuclear data needs for the space exploration initiative.- Neutron spectra measurements and monte carlo simulations of (p,xn) reactions in the medium energy range.- Proton-induced spallation between 600 and 2600 MeV.- Cross sections of p-induced reactions up to 100 MeV for the interpretation of solar cosmic ray produced nuclides.- Measurement and analysis of integral excitation functions for natCu + P up to 200 MeV: influence of the f7/2 shell closure.- 7Be emission in proton and neutron induced reactions.- Measurement of long-lived 10Be, 14C and 26Al production cross sections for 10 – 40 MeV neutrons by accelerator mass spectrometry.- Scattering of 28.2 MeV neutrons from 12C and 18.5 MeV neutrons from 52Cr and 60Ni.- Neutron total cross section measurements at intermediate energy.- Transmission of several tens MeV neutrons and associated gamma rays through iron, lead, and graphite systems.- Measurement of activation cross sections by using p-Be neutrons of energy up to 40 MeV.- Measurement of the nitrogen total cross section from 0.5 eV to 50 MeV and analysis of the 433 KeV resonance.- Fission cross section ratios for 233,234,236U relative to 235U from 0.5 to 400 MeV.- Measurement of neutron induced fission cross section ratios for 235U, 238U and 232Th from 1 to 100 MeV.- Calculation of galactic cosmic ray induced planetary gamma-ray spectra and its application to the martian surface.- RAD-software package for calculations on radionuclide production and radiation doses.- Systematic evaluation of neutron emission cross section for the reactions induced by protons of 80 – 800 MeV.- Production of 7Be, 10Be and 26Al by 4He-induced reactions up to 171 MeV.- Thick target neutron yield by heavy ions.- Relative cross sections of 25 to 70 MeV proton induced fission of 232Th, 233U, 235U, 237Np and 239Pu.- Measurement of the ratio ?f/?n and the fission barrier height for p + 209Bi.- X Nuclear Models and Evaluation Methodology.- Nuclear models relevant to evaluation.- The dispersive optical model.- Recent progress in the statistical theory of nuclear reactions.- Status of the JEF and EFF projects.- Evaluated nuclear data file, ENDF/B-VI.- Japanese evaluated nuclear data library, Version-3, JENDL-3.- Library of evaluated neutron data files.- CENDL-2, Chinese evaluated nuclear data library, Version-2.- The network of the nuclear reaction data centres.- Evaluated nuclear structure data file (ENSDF).- Fission data systematics.- European activation file for fusion.- Evaluation of charged-particle reactions for fusion applications.- International cooperation for compilation and evaluation of the data on charged particle nuclear reaction.- Calculations of photoproduction reactions.- Cooperation in nuclear data evaluation among the OECD countries.- A report on evaluated 238U(n,?) cross section.- International evaluation cooperation progress report of the subgroup on “239Pu fission cross section between 1 keV and 100 keV”.- International evaluation cooperation task 1.1: intercomparison of evaluated files for 52Cr, 56Fe, and 58Ni.- International evaluation cooperation subgroup 7: multigroup cross section processing.- IAEA coordinated research programme on methods for calculation of fast neutron data for structural materials.- IAEA coordinated research programme on measurement and analysis of double differential neutron emission spectra in (p,n) and (alpha,n) reactions.- Uncertainty estimates for the EFF-files for 52Cr, 56Fe, 58Ni and 60Ni.- Scattering laws for moderators, reflectors and filters for application in design calculations of cold and superthenmal neutron sources.- Analysis of possible sources of uncertainties in neutron data calculations.- Fast neutron nuclear data: 239Pu revision and Am status.- Study of a fundamental nearest level spacing distribution of neutron resonances.- The pre-equilibrium picture of nucleon radiative capture and the neutron-to-gamma competition.- Intercomparison of multi-step direct reaction models.- Theoretical analyses of (n,xn) reactions on 235U, 238U, 237Np and 239Pu for ENDF/B-VI.- Statistical multistep reaction model for nuclear data.- Neutron optical potential of 28Si derived from the dispersion relation.- On application of the S-matrix two-point function to nuclear data evaluation.- Evaluation of 14 MeV cross sections for the main isotopes of the structural materials Cr, Fe and Ni.- Evaluation of the silicon isotopes for ENDF/B-VI.- Evaluation of cross sections for the dosimetry reactions of niobium.- Nuclear data evaluation for 233U.- Measurement and evaluation of (n,?f)-reaction effects in the resonances of 235U and 239Pu.- New evaluations of neutron cross sections for 14N and 160.- The EFF-2 evaluation for the reaction systems n + 52Cr, 56Fe, 58Ni and 60Ni.- Photon production cross sections and spectra for (n,x?) on 56Fe.- Cross section evaluations for activation data library.- FENDL: a reference nuclear data library for fusion applications.- REAC*3 nuclear data libraries.- JENDL-3 FP nuclear data library.- Evaluations of secondary neutron energy spectra for Cr, Fe, Ni and Pb.- Delayed neutron data and fission reactor reactivity scale.- Calculations on nuclear reactions of neutrons with 138Ba in the energy range of 0.1 to 20 MeV.- Application of cross section distribution function to the estimation of flux at a point for radiation transport problem.- Analysis of 0–16 photo-reaction cross sections.- Phenomenological nucleon-nucleon K-matrix parametrizations up to 1 GeV.- Rates of the main thermonuclear reactions.- Analysis of fission neutron spectra by non-equitemperature Madland-Nix model.- Modeling of cross sections in the unresolved resonance region.- International nuclear model code comparison study of Hauser-Feshbach calculations.- Estimation of nuclear reaction model parameters for 59Co, 58Ni and 60Ni.- The sensitivity of statistical model capture calculations to model assumptions.- Modified statistical calculations of average dipole radiative strength functions and cross sections of neutron radiative capture in the energy interval 10?3 – 2 MeV.- The inelastic scattering in the presence of direct reactions: description of the high-lying states excitation allowing for unitarity.- Double differential neutron emission cross sections of (p,n) reactions on 59Co and Mo isotopes.- Fast-neutron inelastic scattering cross sections from 2.3 to 3.0 MeV for the actinide nuclei 232Th and 238U.- Qgg-systematics of fast neutron reactions in the mass range A = 50. nuclear structure effects on calculated cross sections.- Energy dependence of the isotopic effect in the (n,p) reaction on medium weight nuclei.- Modelling inelastic emission cross sections for 9Be(n,2n).- Polarized proton induced breakup of 12C at 14 and 16 MeV.- Exciton model analysis of double differential neutron production cross sections for 113 MeV protons.- Closing Session.- Progress and problems in energy-related nuclear data.- Summary on non-energy related nuclear data.- Nuclear data evaluations.- Closing Remarks.- Index of Authors.